Over at QKR Stampede, we have another "Anything Goes" challenge starting today and I'm celebrating St. Paddy's a day early with this adorable image, "Bouquet 13301." This is another of those images which really has nothing to do with St. Patrick but I colored it so that it looks like it was meant to be a specific holiday image. I colored the 'flowers' as if they were shamrocks or 4 leaf clovers and that really cemented the illusion. was vertical on a square card. This is a pretty simple design but I did have fun putting it all together. I colored the bear with ProMarkers and watercolor pencils. I cut the image and the white, stitched frame with dies from Die-namics. Then I found the golden CS and cut it to the size of the card front, and ran it through my 'Linen" embossing folder. Next, I used one of the Die-namics dies to cut a stitched 'window' in it and then I inlaid the image and frame pieces. Instead of having layers, it's actually all in a single layer. I added glittered washi tape as though it was ribbon and made one of my tiny, hand-sewn bows. I printed the sentiment, hand cut it, and added it under the image. That little guy is so cute and I love your card. Great take on the sketch too. Happy Birthday a day early although I'm sure I'll remember (maybe???) to tell you tomorrow too. Just keep on having those wonderful birthdays! What a cute card! Happy Birthday and St. Paddy's Day! This is fabulous Connie, just adore this image and what a fabulous image to celebrate not only your birthday but St Patrick's day too! Oh I love this image and so nicely coloured too. Love your design and colours. Nice work. I won the exact same image recently but I have not yet coloured him up. I must do so soon after seeing your project. Thank you for sharing with us over here at Morgan's Artworld Challenge, best of luck with your entry. Happy Birthday! Lovely St Pat's card. What a great QKR image. Love the glitter paper. Hope your birthday is really special! HAPPY St Patrick's Day and Happy Birthday. Belated happy birthday to you! And happy St Patrick’s Day also! It was so nice of you to visit my blog this weekend, bless your heart. 😃 I like your festive card, especially the green glitter washi tape and the sweet little hand sewn bow. Wishing you many blessings all the year through! 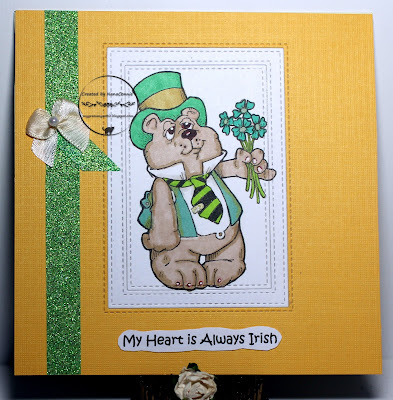 Such a brilliant card and perfect image for St Patricks day, and thanks for sharing with us at Passion For Promarkers this week. very nice. Thanks for joining us at Feeling Sketchy Challenge blog. Happy Belated Birthday you fine young lass!! Love your Saint Patrick's Day bear!! Belated happy birthday to you! And happy St Patrick’s Day also! Love this card - Bravo! Beautiful card you made. I like the way have you used our sketch :-)) The stams is so sweet. Thanks for playing with us at Feeling Sketchy. What a great card! I love your interpretation of our sketch! Thanks for sharing your work with Feeling Sketchy. I hope you'll be inspired by our next sketch too! Lovely card. 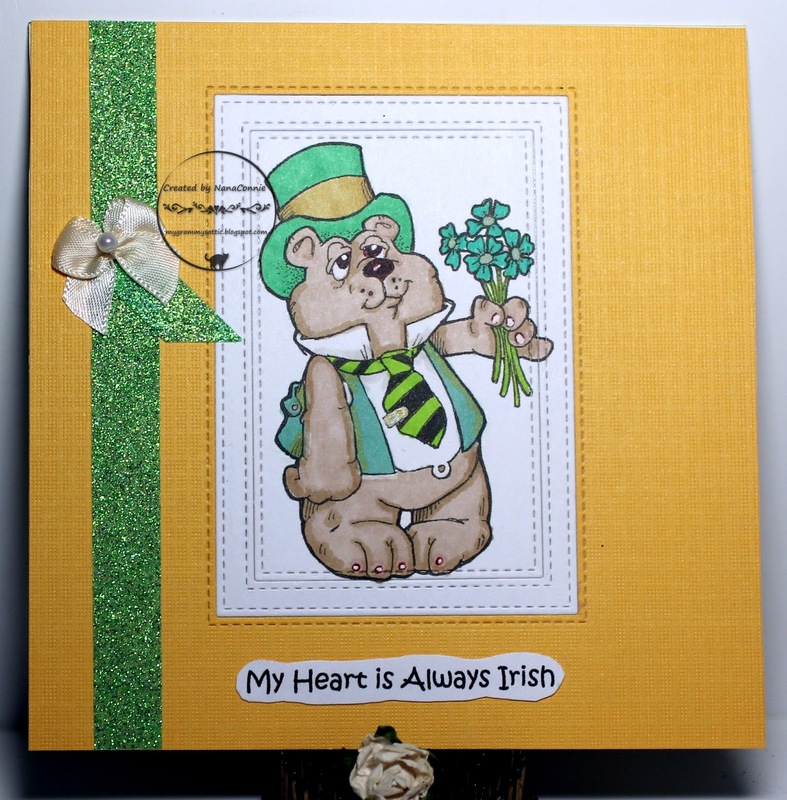 Love that you have made the image into an image for St Patricks day with the coloring. Thanks for playing along with us at Feeling Sketchy.